Thanks to Glen for the heads up. Big news about island-castaway show Lost is breaking over at Comic Con. One of our all time favorites is heading back to the island! Details, and major spoilers, after the jump. Lost news turned up in an unexpected place this afternoon, at the panel and screening of the CW’s new teen vampire soap the Vampire Diaries. Ian Somerhalder, best known as the late great Boone from Lost, plays brooding vampire Damon in the new CW show, and was asked by panel moderator Lynette Rice what being cast on this show would mean for him and Lost, and whether he would be returning for the show’s last season. We were actually talking about it today and… Boone will be coming back to Lost. 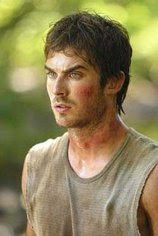 Somerhalder offered no other details, but this begs the question of exactly which other season-one characters will be returning to the island for Lost’s tamat season. All that’s certain is that Somerhalder is going to need that sun-protection ring his vampire character uses in Vampire Diaries when he gets back to the island.